Interoute Virtual Data Centre is the only European-based cloud provider certified for the Red Hat® Cloud Access programme. You can migrate your unused Red Hat license subscriptions to VDC and enjoy high-performance cloud computing with the power and reliability of Red Hat Enterprise Linux, backed by 24/365 Red Hat support for your virtual machines in the VDC cloud. 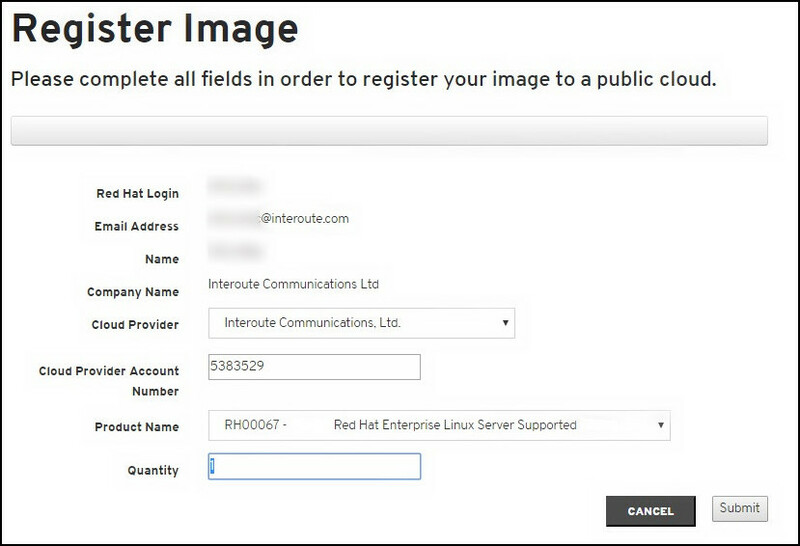 This document describes how to register your Red Hat licenses for use with the Interoute VDC cloud platform. See the document How to upload your Red Hat virtual machine images to Interoute VDC to find out how to import ISO source images to create new Red Hat virtual machines, or import images of your existing Red Hat machines to VDC. You should first confirm with Red Hat that you meet the eligibility requirements of Cloud Access: Review eligibility of your product licenses. To enrol in the programme currently requires you to inform Red Hat and Interoute separately. 'Quantity' means the number of unused licenses of the specific type which you want to transfer to run on Interoute Virtual Data Centre. Download the Interoute Cloud Access signup form and fill in all the fields. You will need to submit separate forms if you are registering licenses for different versions of Red Hat (that is, RHEL version 6 or 7). Send the form(s) by email to cloudstore.licencing@interoute.com. A confirmation will be sent to you by email. Your license agreement remains with Red Hat (according to these terms) and all enquiries about your Red Hat licenses must be submitted to Red Hat customer support. Virtual machines can be deployed by importing your existing virtual machine images to VDC, or by importing an ISO source for Red Hat and deploying new virtual machines. You should not use the standard Red Hat templates available in VDC, or deploy Red Hat machines from the CloudStore website, because these will be billed as new Red Hat licences (paid monthly via Interoute), and they cannot be covered by the Cloud Access programme. See the document How to upload your Red Hat virtual machine images to Interoute VDC for details of how to upload and deploy. Please contact vdc.enquiries@interoute.com if you have any questions about VDC and Red Hat Cloud Access.